Have a Meowy Christmas this year! Holidays are simply more fun with cute cats and cuddly kittens! Makes an especially thoughtful Christmas gift for cat lovers, collectors and anyone who enjoys our Classic Kooler Holiday stockings. 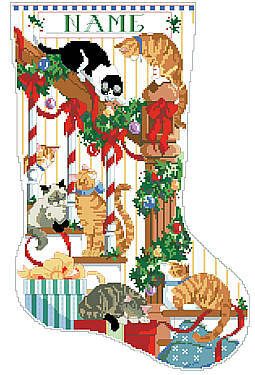 Looks ‘meow-volous’ on your mantel next to your Christmas tree! Contents: Stitch Count 145w X 224h, finished size on 14 count 10-1/4" X 16"